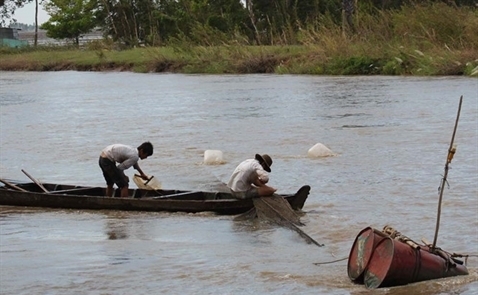 VietNamNet Bridge- Laos is making hectic preparations for the building of one more hydropower dam – Pak Beng – on the Mekong river section which runs through Oudomxay province, despite strong warnings about the influence on the lower course, especially in Vietnam’s Mekong River Delta. MRC (the Mekong River Commission) last week in a meeting in Vientiane said the 6-month pre-consultation process on dam construction had begun, which Laos officially submitted to MRC’s secretariat committee two months ago. At the meeting, the commission came to an agreement that December 20, 2016 was the day to start the pre-consultation process. Thus, the pre-consultation process began one month before the meeting's announcement. Pak Beng is designed to be located on the mainstream of Mekong in the northern mountainous part of Laos. It would have total capacity of 912 MW and water discharge capacity of 6 million cubic meters per second. According to The Diplomat, local people near the river live from fishing and poultry. The site clearance to make room for the project is expected to force thousands of people to leave their homes. Laos is making hectic preparations for the building of one more hydropower dam – Pak Beng – on the Mekong river section which runs through Oudomxay province, despite strong warnings about the influence on the lower course, especially in Vietnam’s Mekong River Delta. Meanwhile, the projects will have impacts on tens of millions of people on the lower course. Thanh Nien quoted Maureen Harris from International Rivers as saying that Pak Beng will have a big impact on the lower course in Laos, Thailand and Cambodia as well, but Vietnam’s Mekong Delta will suffer the most. She said the hydropower dam not only will prevent the evacuation of aquatic creatures, but will also change the current and flood cycles. And it will reduce alluvium and agricultural productivity. The expert said the building of dams should be immediately stopped. Halting projects under construction would allow for more research on the possible long-term cross-border impact of the dams. International Rivers said after MRC’s latest meeting that starting the pre-consultation process was a hasty decision as the documents about the projects have not even been made public. Some sources said the project is developed not to supply electricity to Laos, but most of the electricity output would be bought by Electricity Generating Holding Public, a joint venture of Thailand and China. Cambodia Daily cited a research work by Alto University as saying that the six dams built by China on Mekong have had significant impacts on the river’s water level in the last years.